Master pages provide the look and feel for all of the pages in your site. By changing the styles or content of a master page, you can quickly change the appearance of an entire site. This article shows you how to create and modify a copy of the existing My Site master page and then apply the new or modified My Site master page to all of the pages in your My Site site collection that are attached to it. When you modify your My Site master page, all users will see the changes on their My Profile page. Note: To follow the procedures in this topic, you must have appropriate permissions. By default, you must be a member of the Site Owners group, the Designer group, or a Site Collection Administrator to open a SharePoint Online site with SharePoint Designer 2010 and customize the master pages. If you are a member of one of those groups but cannot see the options mentioned in this topic, your implementation of SharePoint Online might be customized to restrict who can use SharePoint Designer. Check with your site administrator to find out. The My Site master page displays the persistent elements that you see when you navigate from page to page on your My Site, such as controls at the top of the page or the site title. 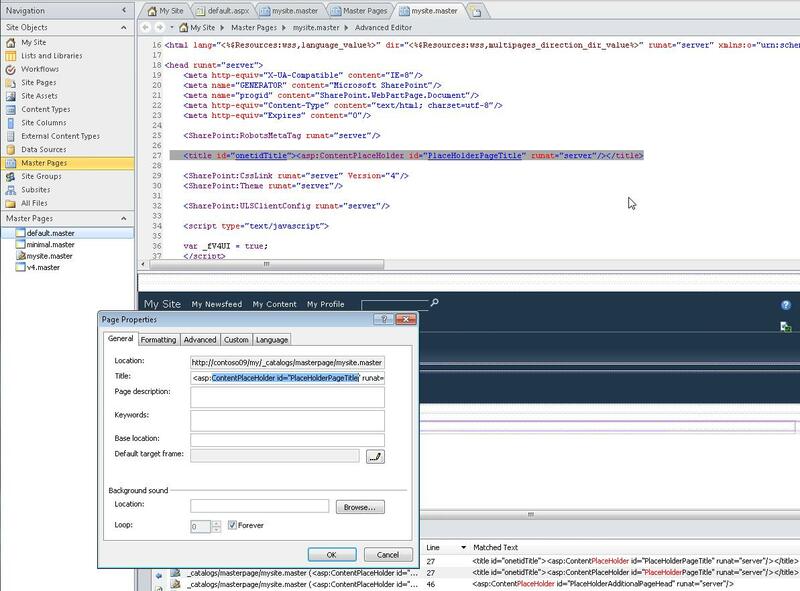 These elements are all stored in the My Site master page. The My Site and My Profile pages in SharePoint are both handled as content pages on the site. When these pages are viewed in a browser, they are combined with the My Site master page to produce a single, continuous web page. The My Site master page displays the persistent elements and layout, while the content pages display the unique, page-specific content. 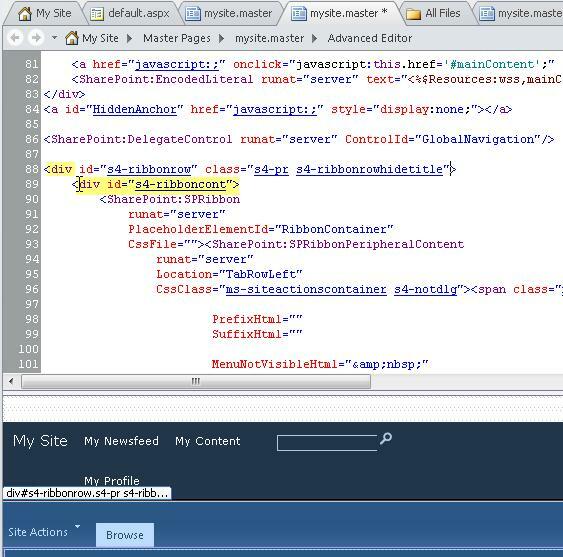 Open your root My Site, for example, https://YourDomainName-my.sharepoint.com, in SharePoint Designer, and then click Master Pages in the Navigation pane. Click mysite.master to see summary information in the Master Page Gallery. Create a new custom My Site master page from scratch, and make it the My Site master page for your site. 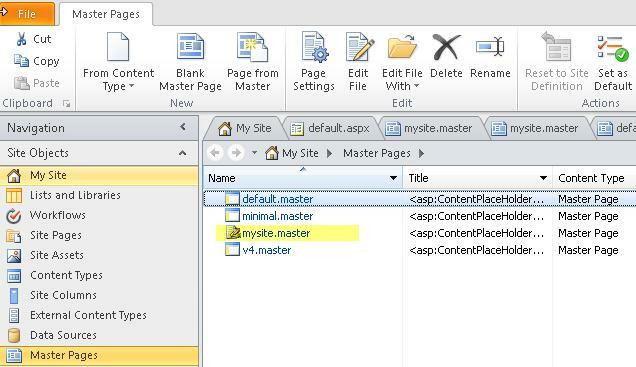 This article focuses on the first approach: customizing a copy of the My Site master page. When you customize a copy of mysite.master, you’re using the existing SharePoint look and feel, with its features, brand, and design elements, and customizing it to meet your needs. While it can be challenging as you try to understand how everything works in the mysite.master page, this approach is useful for minimal branding or customization efforts, like changing the header of your SharePoint pages. When you create a blank custom My Site master page or use the Starter Master Page as the basis of your page, you’re creating the whole design from scratch. While this approach can be challenging because you need to know how to implement a design in SharePoint, it’s also more flexible when you know the design you’re trying to create and you’re working off existing plans and prototypes. The mostly empty page acts like a canvas for you to first build your design and then add the required SharePoint components. For most sites in SharePoint Online for Enterprises, you see four master pages, v4.master, minimal.master, and default.master, in the Master Page Gallery as shown here. If My Sites is enabled, you should also see the mysite.master master page. Right-click mysite.master and then press Ctrl+P to paste a copy into the Master Page Gallery. Click mysite_copy(1).master to see summary information in the Master Page Gallery. 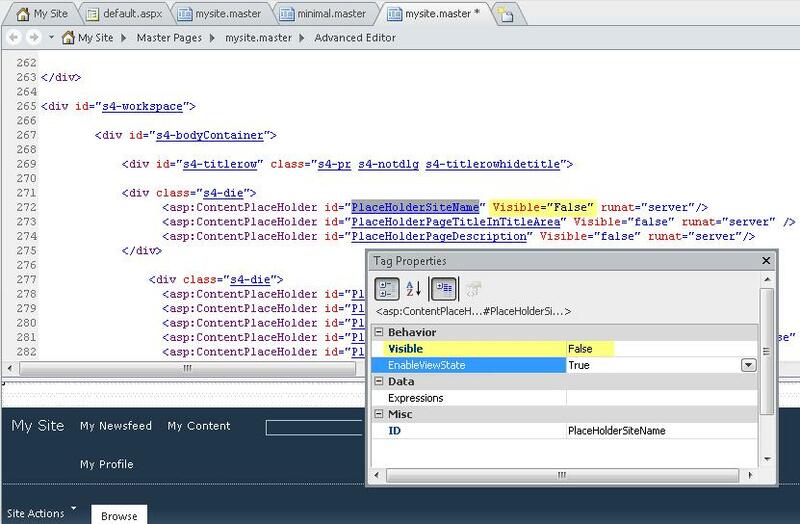 Important: When you customize master pages, avoid deleting content placeholders. Doing so might break some pages and even sites associated with the master page. It’s a good practice to simply hide instead of delete these controls. A content placeholder control is a piece of code on a master page that works together with a content control on a content page. The content placeholder control displays default content (which can be no content, if the control is empty) for that region on the page. The default content can be overridden by unique content from a content control on a content page. 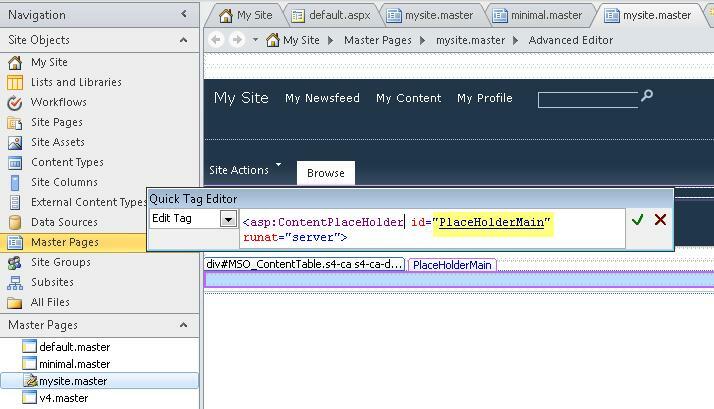 Follow these steps to locate the PlaceHolderSiteName content placeholder control on a SharePoint 2010 My Site master page. In the master page gallery, click mysite.master. Note: The Tag Properties for this placeholder are set to Visible=False by default. 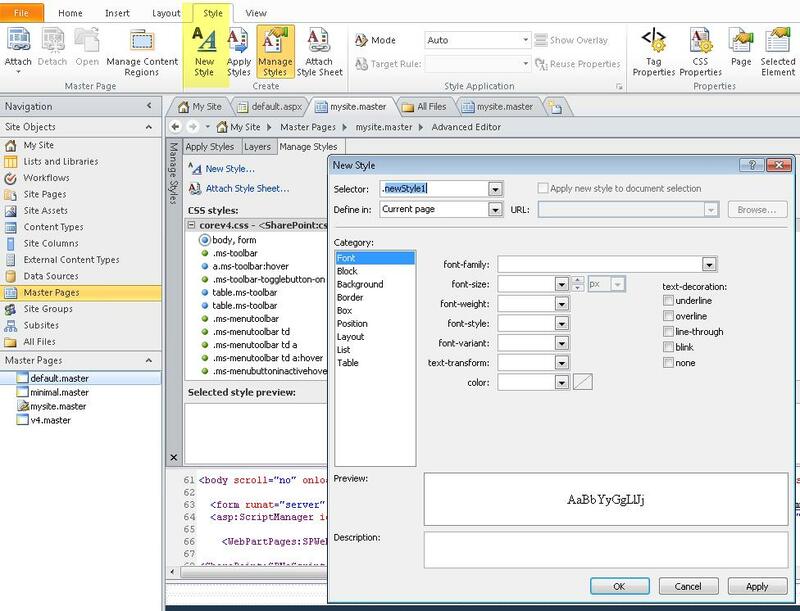 In Split View, in SharePoint Designer 2010, you can select the tag, right-click it, and choose Tag Properties in the context menu that appears to see the value.